NINETEEN COUNTRIES HAVE been identified as suffering from levels of hunger that are either “alarming” or “extremely alarming”. The Global Hunger Index (GHI) for this year by Concern identifies and visually maps hunger levels and hot spots across 120 developing countries and ‘scores’ their hunger status. This year’s index indicates that global hunger is decreasing, with the GHI score falling by 34 percent from the 1990 GHI score. South Asia has the highest regional GHI score, followed by Africa south of the Sahara. For individual countries, Burundi, Eritrea and Comoros have the highest levels of hunger. 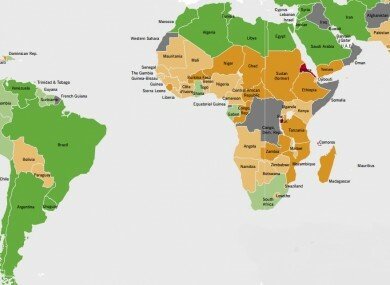 Here is a map of the world, indicating countries that have the highest levels of hunger. The countries in yellow have serious levels of hunger, while the light orange countries have “alarming levels” of hunger. The countries in red have “extremely alarming” levels of hunger. (If you can’t view this image click here). Concern state that most countries where the hunger situation is already “alarming” or “extremely alarming” are countries that are vulnerable to the negative effects of extreme weather events, climate change, population pressure, conflicts and economic crises. They said that traditional coping mechanisms in these countries as well as the capacity of governments are in many cases hugely challenged. The CEO of Concern Worldwide, Dominic MacSorley, has today called for a more holistic model of aid and long-term development. He said it should be “based on building the resilience of communities vulnerable to natural disasters and global economic shocks”. Fire-fighting with emergency aid is not enough. Aid agencies, governments and international organisations need to learn lessons from the past and boost future protection measures to reduce the impact of extreme weather events and other hazards on the world’s poorest and most vulnerable people. We can’t predict every possible terrible event, but we need to break the endless cycle of disaster-respond, disaster-respond where we can. Email “Global Hunger Index falls 34 per cent since 1990”. Feedback on “Global Hunger Index falls 34 per cent since 1990”.